I greatly value the College Art Association’s steadfast advocacy for visual arts professionals. I am eager to contribute to its work as an essential resource for a diverse body of practitioners to intellectually engage in the field. 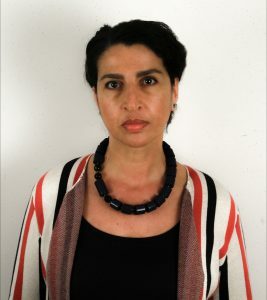 As a working artist, academic, and member since 2010, I regularly interact with CAA content and programming in a variety of ways and am excited about the organization’s strategic plan to diversify communication channels and connect with under-represented visual arts professionals and communities. An area of particular interest to me is welcoming community college faculty and students to participate as an important aspect of a vibrant future for CAA. As an Associate Professor at CUNY-LaGuardia Community College in Queens, NY, I meet non-traditional students as they enter a transitional space of learning, as the first step into a study field that leads to various modes of continued education and engagement with the arts. Being an artist and professor who started her own educational path at a community college, I recognize the powerful impact that envisioning a professional future in the arts has on students. At LaGuardia, I have worked to develop curricula that expands learning beyond the studio, through experiential learning opportunities and exposure to learning outside of the classroom. As enrollment in community colleges has grown significantly, these faculty are a vital constituency as they design programs and mentor students in pursuing continued education and careers in the arts. I believe that CAA-affiliated regional events around core issues could provide opportunities to interact with colleagues from senior colleges, graduate programs and institutions to strengthen best practices. I would also advocate for more mentoring opportunities for people at different points in their careers. As a working artist, I exhibit regularly and widely, and have received awards from the Joan Mitchell Foundation, MacDowell Colony, New Jersey State Council on The Arts, amongst others. Another area of interest is growing the platforms for CAA members to share resources and research, through both events and digitally, with those outside of academia, including unaffiliated artists. Expanding CAA’s support for artists through micro-conferences, exhibition support and an active online community are potential ways to connect beyond the annual conference, fortify networks between ongoing research and practice, and to invigorate and inspire future members. I am dedicated to expanding the diversity of voices in the creation, teaching and analysis of visual art. If elected, I would take on the role of CAA board member with an active, serious commitment to serve all members as well as further the organization’s mission and vision.